WEDNESDAY, Oct. 24, 2018 (HealthDay News) -- Brisk autumn winds and chilly winter temperatures may make you more vulnerable to heart trouble, a new study suggests. 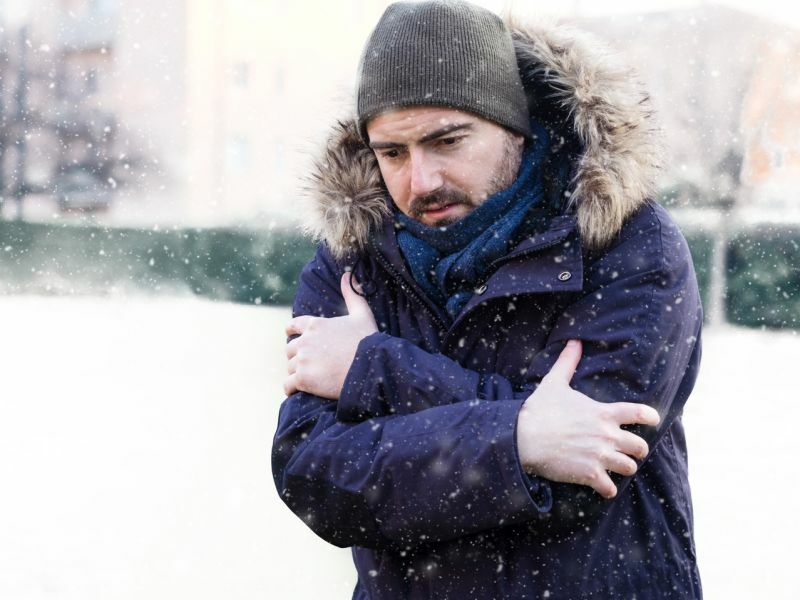 Researchers found "an increase in heart attacks in low temperature, strong wind, low sunshine duration and low atmospheric pressure," said senior author Dr. David Erlinge, head of cardiology at Lund University in Sweden. However, the news isn't all worrisome. The risk of heart attack decreased about 3 percent for every 45-degree Fahrenheit (F) increase in minimum air temperature, the study reports. "It's important to note the overall effect here is quite modest," said Dr. Usman Baber, an assistant professor of cardiology at the Icahn School of Medicine at Mount Sinai in New York City. The study involved more than 274,000 Swedes who had heart attacks between 1998 and 2013. Researchers looked up the weather on the day of each heart attack, to see if certain conditions appeared to make people more prone to heart problems. Air temperature had the most profound effect on heart attack risk, with risk greater when the temperature dropped below 32 degrees F. But short days of sunshine, brisk winds and lower air pressure also were linked to increased risk. The observed increase in heart attack risk could be due to weather's effect on the circulatory system, Erlinge explained. "We know that cold and wind cause the body to contract the blood vessels of the skin to preserve temperature and energy," Erlinge said. "This causes the heart to pump against higher resistance, which increases the stress on the heart and may trigger a heart attack." However, the study can't prove a cause-and-effect relationship, and Baber noted that many other factors may also be at play. "I suspect the basis for this observed association is going to be more complex than that," Baber said. "Physiology may play a role, but other factors like patient behavior that varies with weather might play a role." "When weather changes, people may behave differently," Baber continued. "Maybe they are more stressed. Stress plays a major role in heart attack risk. Maybe people don't take medications as frequently." Reduced physical activity, dietary changes and depression are other behavioral factors that could influence seasonal heart attack risk, the researchers added. Folks also might be more prone to respiratory infections and flu during this type of weather, and those illnesses are known risk factors for heart attack. For example, it's been shown that a respiratory infection can cause a six-fold increase in the risk of heart attack, the researchers noted. If you're concerned about your heart health, take the time to slip on a sweater or jacket during brisk days, or bundle up when the mercury takes a deep dive, Erlinge said. "If you are at high risk, you may avoid going out in really cold, windy weather," Erlinge added. The study was published Oct. 24 in the journal JAMA Cardiology.